What is the “Cruiser’s CrutchTM“? Designed by Foresters For Foresters! Use the “Cruiser’s CrutchTM“ for Variable Plot Cruising. The“Cruiser’s CrutchTM“ is versatile, quick and durable. Saves time and money and increases efficiency. The “Cruiser’s CrutchTM“ results in more accurate timber cruises by compensating for slope. Basal area will consistently be missed when variable plot cruising with wedge prisms or other horizontal critical angle gauges, without slope compensation. Enables slope compensated readings on 0% to 90 slopes, in 5% increments. Constructed of clear, tough LexanTM, with 23″ nickel-plated chain. Has four brass balls, one for each BAF. English (E) BAFs: 10, 20, 30 & 40…. The “Cruiser’s CrutchTM” replaces four-prisms and compensates for slope. 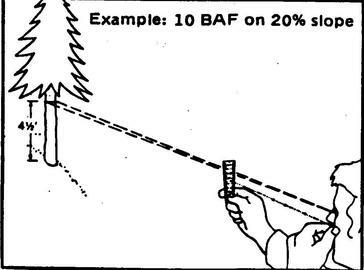 To use, select basal area factor desired and determine slope from plot center to the tree to nearest five percent. With eye over sample point, hold the appropriate brass ball under your eye lightly touching cheek. 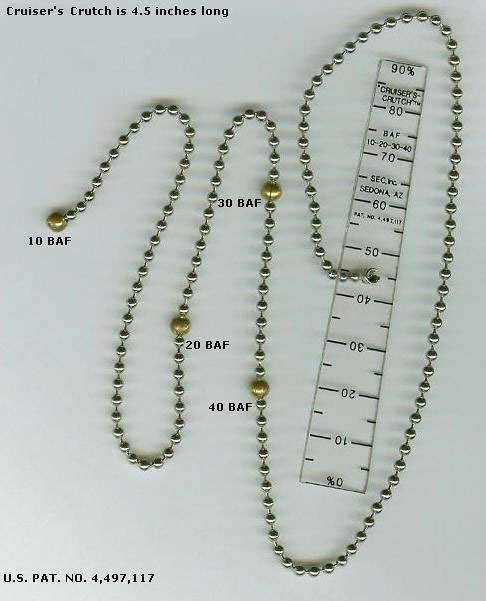 Move the gauge away from eye until the chain is taut. Line up tree with appropriate slope percent line on the “Cruiser’s CrutchTM“. If the tree at dbh is wider than the line on the “Cruiser’s CrutchTM“ being sighted across, tally the tree.